Mike is part of OAR’s founding team. A native of Weymouth, MA, and a lifelong Boston Red Sox fan, he graduated from Holy Cross and later earned a master’s degree in Business Management from Central Michigan University. 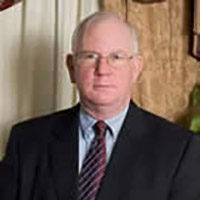 Mike served 23 years in the U.S. Marine Corps, included tours in Vietnam and the first Gulf War. Before joining OAR, he served as executive director of the Marine Corps University Foundation in Quantico, Va. and the Autism Society of America Foundation. Mike and his wife, Elaine, live in Burke, VA, and have two musician sons, Kevin, a Staff Sergeant in the U.S. Army Ceremonial Band, “Pershing’s Own”, and Doug, Director of Bands at Chantilly High School in Chantilly, Va. In his off time, Mike enjoys: any occasion to hang out with Kevin, Doug, and their wives, being Grandpa to Maxon and Selah, writing, enjoying his sons’ musical endeavors, and rooting for Boston sports teams.